During last week's trip to the mainland, Tim and I stopped at Brae Island for a walk. The island is in the Fraser River, alongside Fort Langley, built by the Hudson Bay Trading Company in 1827. The fort itself is a National Historic Site, and there is also a small town grown up beside it. It's a fun place to wander, with cute shops and interesting buildings. But this was New Year's Day and little was open. The Fraser River is navigable by fairly large ships for a long ways. These abandoned pilings bear mute witness to the industry that once bustled along the shores. In the Garibaldi Mountain Range across the river, these peaks played peek-a-boo with the clouds. The peaks were originally named the Golden Eyries, but the name became Golden Ears, and that's how these peaks are known today. The park encompassing the mountains is popular with hikers and campers, although I wouldn't have wanted to be camping up there in January. Once home again, I spent some time sewing. I wanted to make another project bag to hold my embroidery. As I began pinning the pieces together, I realized that the large floral print was directional, and going sideways instead of up and down. So I cut the bag dimensions in half, turned the flowers right way up, and ended up with two smaller bags. One of my New Year's intentions is to use up some of the many teas I have in my cupboard. There is a large box of various kinds, and they get ignored since I usually grab a bag from the canister on my countertop. So I sorted through the individual bags and put them into a small bowl in plain view where I'm more likely to use them. I like a little honey with my tea, as well. There's been a lot of tea made during these days at home. I'm beginning the new year with a new journal. Starting a blank book is full of possibility, and scope for imagination, don't you think? I have three of Laura Calder's cookbooks, and took this one from the library. I think it will go onto my wishlist, as well. I've never had a bad recipe from Calder - her books are full of inventive, but not labour-intensive ways to prepare vegetables, soups, and main courses, with a few desserts. You won't find muffins or very many cookies in her books. And one more photo from the mainland - of the birds at the Great Blue Heron Nature Reserve in Chilliwack. These were taken after the ice storm, and the birds were happy to crowd around the feeders. A squirrel was happy to clean up some of the mess made by falling birdseed. He looks quite fat and content. School begins tomorrow, with a bang. A couple of hours ago another teacher contacted me - due to a family situation, I'm covering her morning classes. As well, a couple of visiting students from Brazil will be in my Spanish class in the afternoon. I find that I can understand Portuguese because of its similarity to Spanish, so we'll see if that works in reverse. Happy New Year, Laurie, sending you and your family all the very best wishes for 2018. Lovely mountain and lake side scenes but it does look bitterly cold over there, cute photos of the birds and little chubby squirrel! Hope the first day back at school goes well, happy MM. Happy New Year! Such beautiful scenery on Brae Island. Lorrie you seem to find time in your day for so many different activities. It's amazing. I love the New year journal. My niece gave me a travel journal, which is somewhat like a scrapbook, and I'm really looking forward to using it. It is lovely to see the image of the squirrel and the birds happily eating together in the snow - something that would probably not be witnessed in warm weather conditions. Good luck with your new school term Lorrie. It looks like Laura Calder is holding a plate of muffins on the cover of her book that doesn't speak much about them! That's a good idea for using up the old tea, of which I have plenty. Hope your back to reality goes along pleasantly. Beautiful photos, the mountain are stunning. one whining for the children to be back to school. who takes regular walks all year long. It is certainly not common in my little sphere. any given corner. Guess that’s why I prefer cemetery “trails” when the gates are open. What a lovely New Year's day you had spending time together on Brae island. The sky and sea blended into one in the first photo. Garibaldi Mountain is so beautiful. Such a lovely photo of the squirrel eating seeds and the birds together in the snow.I am smiling!Lovely day to you. Your mountain view is stunning. We have as little snow as you, just waiting when it starts to snow and the cold winter starts. Wishing you a lovely week. Hope you have a good week at school. The country around where you live is just so stunning. Thanks for sharing your outdoor pictures. Tea and a new journal are the best for the beginning of a new year. Teabag packages can tend to get lost, good idea to put a few out to grab. You took us on a beautiful tour, you certainly live in a beautiful part of the World. Hope all goes well with your students from Brazil, if all else fails hand gestures are useful. Take care. Happy 2018! Your snowy scenes are lovely. Have a great week ahead! Lorrie, Happy New Year! Love the blue and white teapot and I am joining you in clearing some of the tea I have collected. I want some of the excess gone and so I have room for the regulars. Love the watercolor of the journal. I need to start a book journal for 2018. Your nature photos are lovely. Sylvia D.
Beautiful photos, Lorrie. Your sewing projects are so pretty. So, you got to experience the Frazier Valley freeze. I've been putting out my assortment of tea bags for our small group gathering each week and am happy to see them being used up. Amazing how they accumulate in the cupboard. Hope you have a good returning to work week! I think your photograph of the Garibaldi Mountain Range across the river is just lovely, a beautiful scene. Hope school starts and goes well for you, have a good week ahead. I hope your new semester got off to a great start today! Gosh you are ambitious -- I'm not sure I could even have thought of blogging while I was still working and you do such a fantastic job ... you amaze me. I'm glad the nasty weather didn't spoil your vacation -- you even got outside and got some wonderful pictures. Happy New Year to you and yours. Sorry for deleting my comment, it posted oddly! I hope school goes well for you! Lorrie - I sighed when I saw your project bags - I REALLY need a better alternative than plastic shopping bags! I am adopting your tea bag approach - I need to drink more tea and just don't think of it enough - if it's in front of me, I will. 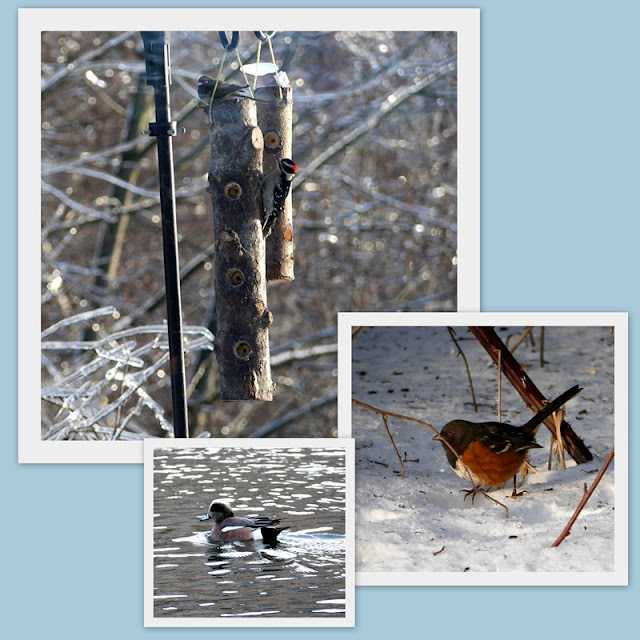 I am fascinated by the bird feeders that appear to be made from small logs - I like the idea and the look better than a plastic feeder. I will have to do some investigation! Hope your day went well today. Hope your first day back to school went smoothly. It must have been lovely to have ha a break. I am a big tea drinker, especially when it is chilly. Enjoy! You've answered a question for me. I wondered why the bridge was called Golden Ears. Last time we were driving in the lower mainland we tried to avoid the toll bridges and drive around like we used to. What an adventure that turned out to be. A new journal is alway exciting ....and then I find at some point in hte year I forget all about it. You must be very organized to accomplish all you do Lorrie. Best wishes for the new year! Beautiful scenery and love those bags. Happy New Year, Lorrie! I join you in the plan to use up my supply of teas and other items in my pantry, before buying new ones. I enjoyed seeing your beautiful photos form the mainland and the different birds that live there. My husband can speak quite a bit of Spanish, as it is similar to Italian. Two of his cousins recently moved to Spain so we may make a trip to visit them one day and see some of that country. Hi Lorrie, I'm popping by a few blogs for a visit today. My eyes tire easily so I can't spend too much time reading. I enjoyed your photos of the valley and Golden Ears Peaks. They are beautiful! I have way too much tea....a whole drawer full in our pantry! And I got more for Christmas. I'm trying to make my way through them during this cold weather we've had although today it's 10C and raining. I hope you do fine with your extra teaching hours. Enjoy the weekend. Loving catching up on your posts. The top photo here looks like a brilliant watercolor painting. I love your creativity with your bags you sewed. I have not previously heard of Laura Calder but see that I must check out her books now. Happy new year!